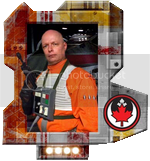 I found this thread of templates for designing your own X-Wing helmet. Which I have found very useful with designing mine. However I like designing in Adobe Illustrator, so using HazardThree's templates I have designed my own AI file templates and decided to share them with everyone. Those versed in illustrator will know how to use it. Maybe even make the templates better. I will try to get around to making more templates for other helmets. And I would like to thank HazardThree for his awesome templates. I will still keep referring people to there who are designing their own helmets. Thank you. I prefer using AI as well. Updated first post with addition of new template. My new template I created myself from scratch. I took photos of my own, not even started building yet, helmet. Then in Adobe Illustrator I traced over the major contur lines of the helmet. Some parts I had to get a little creative to remove perspective, however it should still be accurate or extremely close. Free for anyone to use, so enjoy. Possible to get as SVG, perhaps? Ask your mechanic to be sure to use only GENUINE Incom parts. Done, just had to open and save as SVG in Adobe. Only did my 2nd template though as it's more accurate than the first one. Totally missed this thread while I was buried under all the Celebration prep. Looks awesome, great job! When I have time, I might combine this thread with the other so all the templates are in the same place. The more the merrier! And if you want to take a stab at the A-wing helmet, we could really use a template for that one too. Photobucket makes the PNG links nearly useless these days... any chance those can be converted to Dropbox links as well? I'll just use the Illustrator files (thank you!!!) but that would probably be helpful for many. I like these versions better than the ones in the main template thread.